Corn is pretty much life. Well, not really. But it's sooo good. I hadn't eaten it very much until Matt came into my life. It's weirdly like his favorite food. We have been adding it to a few of our dishes, and this one from Food Network is one we have to try. For the chipotle salt: Combine the chipotle powder and salt and store in an airtight container. For the corn: Heat a grill or grill pan over high heat until hot, and then add the corn and char on all sides, turning occasionally, until blackened in parts, 12 to 15 minutes. When cool enough to handle, cut the kernels off the cobs. Sprinkle with the remaining 1/4 cup cotija cheese and more chipotle salt. 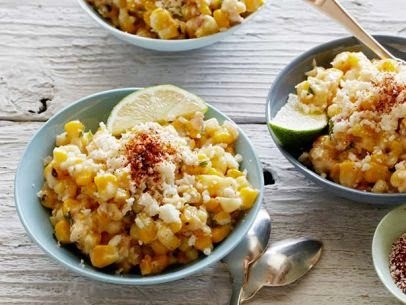 Cook's Note: This recipe is great with an added squeeze of fresh lime juice.